The Steel type, which we should all be familiar with by now, is one of the seventeen elemental types. 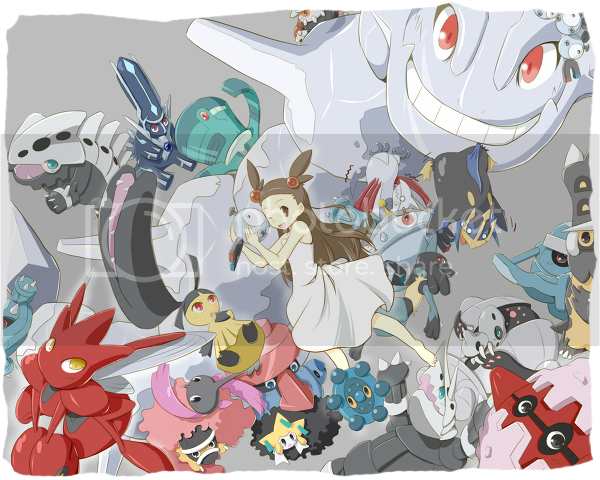 Some notable trainers that specialize in the Steel type include Jasmine of Olivine City, Steven Stone, former champion of the Elite Four of Hoenn, and Byron, Gym Leader of Canalave City. The Steel type was introduced in Generation II. As well as introducing new Pokémon with the Steel type, Magnemite and Magneton are Dual Type Electric/Steel Pokémon. There are also the new Psychic/Steel dual type pokemon Bronzor and Bronzong, which have the ability to resist all three types that are known as the Steel Types weaknesses, countering fire with “Heatproof” or Ground with “Levitate” while always cutting the damage taken from fighting moves with their secondary psychic type. Personally it's my favorite type in the entire game, an in my opinion one of the most impressive in terms of defensive capabilities. With resistance to 11 of the 17 types in the game and a Resistance to the Poison type with Feared moves like “Toxic”, though it has a weakness to fire ground and fighting type attacks, however these weaknesses are usually void thanks to the fact that very few steel type Pokemon are without a secondary Type. Their special defense is lower than their Defense but still higher than most of the types in the game. As for on the offence its not recommended to use steel type moves as there are only 2 types weak to steel type attacks Ice and Rock both of which are almost never used defensively. Though again i point out that there are only 2 pure steel type pokemon, so most have a secondary type of offset the disadvantage. Allowing the steel type to be able to take a beating and still answer back accordingly. Also with elite special attackers like Empoleon, Lucario and Magnezone they can realy shine in the sp attack field and with some offensive forces like metagross and scissor they can still hold their ground in terms of attack. In contest steel type moves usually become “Cool” but they can also be of the other contest types. The steel types was also introduced in Generation II, though no Pure steel type pokemon were around then, and it was never realy a popular type, recent games have seen a change to that and its been recognized as a force to be reckoned with, expect to see a lot of the steel type in competitive battling today, with their amazing walling capabilities and their untapped and most times unsuspecting power, they have firmly made their place among the top types in the world of Pokemon!